For truck and high volume fueling. • Compatible with unleaded, diesel and Ethanol blends through E10. • Compact and light weight for easy handling. • High flow rates due to laminar flow design. • High strength step shoulder bearing diameters and impact absorbing stops. • Double o-ring seals at each swivel provide long life at low temperatures (-40° F/C). • Multi-Plane, full 360° spherical rotation for easy movement of nozzle. • Raised stainless steel ball bearings provide easy joint movement, greatly improving ease of swivel when used on high pressure systems. • 75% less back pressure. 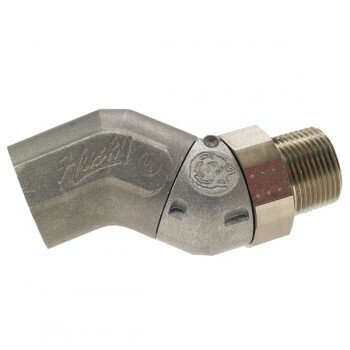 • Multi-Plane, 210° spherical rotation at the swivel nut. • Double o-ring seals at each swivel provide long life at high temperatures (482° F / 250° C).